Ever since I heard the homily about the importance of Baptism and lighting a child’s baptismal candle each year following their Baptism by Fr. Jim Wall, now Bishop James S. Wall of the Diocese of Gallup, I always wanted to renew my baptismal promises on the actual date of my Baptism – March 17. Being Baptized by Rev. Joseph Nativo at St. Lucy’s Catholic Church in Newark, NJ on March 17, 1974. For whatever reason, I have never done so until today. After reading Rosario Rodriquez’s blog post last week titled, Today is the Anniversary of my Baptism, it got me thinking that I should do the same thing since my baptismal date was coming up. After speaking to my Pastor, who is also my boss, Fr. Will Schmid, and explaining to him what I had in mind regarding my baptismal promises, he agreed to renew them with me today. V. Do you renounce Satan? R. I do. V. And all his empty show? R. I do. V. Do you believe in God, the Father Almighty, creator of heaven and earth? R. I do. V. Do you believe in Jesus Christ, his only Son, our Lord, who was born of the Virgin Mary was crucified, died, and was buried, rose from the dead, and is now seated at the right hand of the Father? R. I do. V. Do you believe in the Holy Spirit, the holy Catholic church, the communion of saints, the forgiveness of sins, the resurrection of the body, and life everlasting? R. I do. V. And may almighty God, the Father or our Lord Jesus Christ, who has given us a new birth by water and the Holy Spirit and bestowed on us forgiveness of our sins, keep us by his grace in Christ Jesus our Lord, for eternal life. R. Amen. Share with us in the comment box below the date you received the Sacrament of Baptism. If you don’t know the date of Baptism, I would encourage you to seek it out so when the date comes up on the calendar, you can ask a priest or deacon to renew your baptismal promises. June 19, 1960 – One day before my parents one-year wedding anniversary. 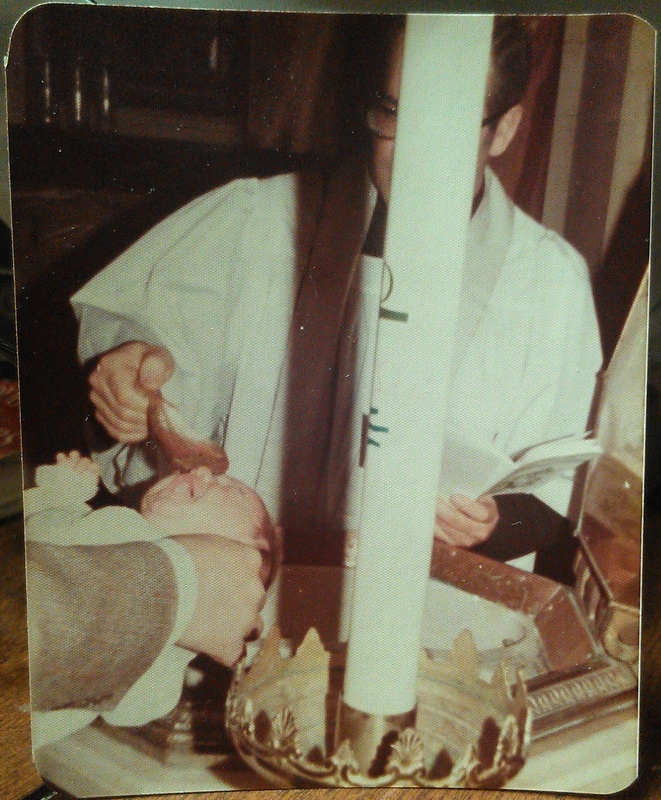 My Holy Sacrament of Baptism was January 3, 1965 in St.Bernard Church in Blackfoot, Idaho. What joy and thanksgiving I feel in my soul. My God Mother always prayed for me! I am forever thankful to St. Bernard for his prayers for me on the day of my Baptism and everyday since! I believe the Saint of the church where we receive the Holy Sacraments has a special love for our souls!